Out My Backdoor: Do Butterfly Boxes Work? During the past century, a host of roosting and nesting boxes were developed to benefit a number of wildlife species including wood ducks, bluebirds, owls, prothonotary warblers, brown-headed nuthatches, Carolina chickadees, great crested flycatchers, fox and gray squirrels, and others. All of these manmade structures have been invaluable in enhancing habitats for these animals. A few decades ago, the butterfly box (also called a hibernation box) appeared. It was purported to provide butterflies with a place to hibernate. Since the tall, slim structures are attractive and are supposed to help butterflies, newspapers and garden and nature magazines were quick to promote this new innovation in backyard wildlife management. The basic design of a butterfly box is quite simple. The box is usually about 2 feet tall and some 5 inches in diameter. It is equipped with a series of vertical slits that measure about a half-inch wide and 3 to 3 1/2 inches long. These long, narrow entrances are fashioned to allow butterflies to walk inside. The walls of the interior are rough. Long strips of bark are placed inside the box. Supposedly the rough interior walls and bark provide perches for hibernating butterflies. Sometimes rotten bananas and other fruits are placed inside the box to lure butterflies inside. The boxes are normally erected in or near flower gardens a few feet above the ground. Some proponents even go so far as to recommend that butterfly boxes be placed facing the south. Some 20 years ago, I had never seen a butterfly box until an Atlanta-area proprietor of a farm and garden center brought me a box while I was program manager for the state Department of Natural Resources’ Nongame-Endangered Wildlife Program, now the Nongame Conservation Section. He told me that although some of his customers were asking about butterfly boxes, he didn't want to sell the structures until he knew if they worked. With that in mind, he asked me to use the box and let him know if butterflies used it. I agreed and mounted the box on a split rail fence that encircles the front yard of the Nongame office in Forsyth and waited. During each of the succeeding several winters I checked the box. Although I never found a butterfly inside, the box proved to be a haven for wasps and spiders. Eventually a pair of brown-headed nuthatches took a shine to the box and enlarged one of the long, thin entrances enough to permit them to enter and build a nest. Since that time a steady stream of young nuthatches have fledged from the box. My experience with the butterfly box mirrors that of other folks across the country. As it turns out there are very few records of butterflies ever making their way inside butterfly boxes. Like me, others have found that butterfly boxes are more likely to attract cockroaches, wasps, spiders and ants. A few years ago, the North American Butterfly Association http://www.naba.org/ asked its members if they had found that butterflies actually use butterfly houses. Not one member said they had. As a result, NABA came to the conclusion that butterflies don't use these structures. The reason that butterfly houses don't seem to work is simple: The vast majority of butterflies don't overwinter as adults. They spend winter as an egg, pupa or chrysalis. For example, out of the 170-plus species of butterflies known to occur in Georgia, only a handful survive the winter as adults. 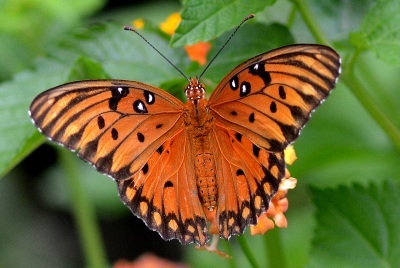 Depending on where you live in the Peach State, the short list of butterflies that overwinter as adults includes the American snout, mourning cloak, queen, comma, goatweed emperor, question mark, sleepy orange and both the American and painted lady, to name a few. During winter, these hardy butterflies commonly seek shelter in a number of places, including brush and wood piles, bark fissures, abandoned buildings, and hollow trees. They emerge from these protected locations on warm winter days and return again when temperatures drop. The bottom line is, go ahead and erect a butterfly nesting box if you want to; it won't do any harm. However, you should realize that while a box makes an attractive addition to any yard, it will not help butterflies. If you are toying with the idea of adding a butterfly a box to your yard, since butterflies are still abundant, there is no better time than right now. If you do decide to take the plunge, consider conducting your own personal butterfly box use survey. Record a description of the habitat where the box is erected as well as the animals found using it. Then move the box to a different location the following year and see if placing it in a different habitat made any difference in the animals that used it. Perhaps you will discover that, when placed is a certain habitat, butterflies will use your butterfly box. But, if you do adorn your yard with a butterfly box, please let me know what – if anything – uses it! Terry W. Johnson is a former Nongame program manager with the Wildlife Resources Division, a backyard wildlife expert, and executive director of TERN, the friends group of the Nongame Conservation Section. (Permission is required to reprint this column. Contact rick.lavender@dnr.ga.gov) Learn more about TERN, The Environmental Resources Network, at http://tern.homestead.com. "Out My Backdoor” columns archive. During the past century, a host of roosting and nesting boxes were developed to benefit a number of wildlife species including wood ducks, bluebirds, owls, prothonotary warblers, brown-headed nuthatches, Carolina chickadees, great crested flycatchers, fox and gray squirrels, and others.